representation for a number in a slider. I have the slider as an u8 wired to a fixed point then to( number to boolean) but I am lost as to how to go from the boolean to the leds I have attached a picture of my block diagram. 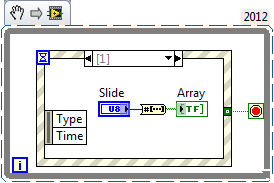 You might have a little better luck posting this question in the LabVIEW board. I took a quick shot at what I think you might be trying to do. If your slide values are only 1 to 8, and you don't want your LEDs in an array you can use your slider as an input to a case select structure. Then just put each LED in a case corresponding to the slider input. It's a little more programming work. But it will be easy to see how it works.